Birth of George Halford registered March quarter 1883 in Stourbridge. 9 Fox Street, Woodsetton, Staffordshire. Francis Halford (38, Breeze Burner, born Tipton), his wife Elizabeth (36, born Shropshire) and their 7 children: William (14, Coal Miner, born Brierley Hill), Francis (12, Scholar, born Brierley Hill), Florence (10, Scholar, born Brierley Hill), George (8, Scholar, born Brierley Hill), Ada (6, Scholar, born Brierley Hill), Wallace (4, born Woodsetton), and Robert (1, born Woodsetton). 37 Regent Street, Woodsetton, Staffordshire. Elizabeth Halford (44, Widow, born Madeley), and her 7 children: Florence (20, Worker in Tin Warehouse, born Madeley), George (18, Coal Miner – Loader, born Madeley), Ada (16, born Sedgley), Wallace James (14, Coal Miner – Loader, born Sedgley), Robert (11, born Sedgley), Harold (9, born Sedgley), and Albert (5, born Sedgley). Robert Halford (21, Coal Mine Holer, born Woodsetton), his wife Mary (21, born Woodsetton), their 2 children: Rachel (2, born Woodsetton), and Arthur (2 months, born Woodsetton). Also Robert’s brother George Halford (27, Coal Mine Holer, born Woodsetton). The ‘Soldier’s Effects Register’, which was released on ancestry.co.uk in 2015, shows that George nominated his mother Elizabeth as his sole beneficiary in his will. His outstanding army pay of £4/11/4d (4 pounds, 11 shillings and 4 pence) was paid to his mother in November 1916. A further £5 was paid to his mother on 16th September 1919 as a War Gratuity. 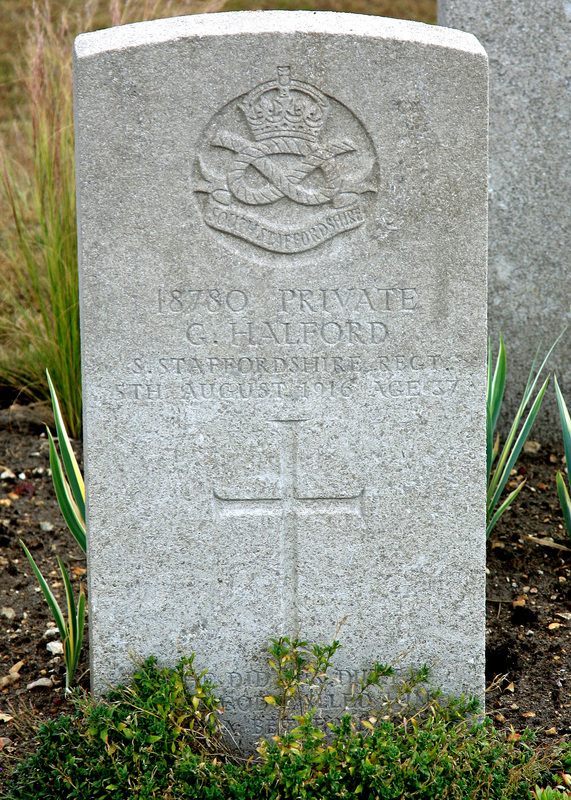 The Commonwealth War Graves Commission Headstone records show that his next of kin (his mother) Mrs E. Halford, of 9 Court 3 House, Wood Street, Tipton, paid 11 shillings and 11 pence for the gravestone inscription: “He did his duty and God called him to a better place”. The 9th battalion South Staffords was the Pioneer battalion for 23rd Division. They had arrived in France on 24th August 1915, and George Halford joined them in 1916. Pioneer battalions were trained as infantry to a degree, and would act as infantry in extreme conditions, but they were primarily a labouring battalion. Their main work would be with pick and shovel digging and reinforcing trenches, their work would often be at, or near, the front line. George died on 5th August 1916 in No. 12 General Hospital located at the racecourse in Rouen; this is about 100 miles south-west of the Somme region where George was wounded. His injury would have seen him move through the Casualty Evacuation system, from Aid Post to Field Ambulance, to Casualty Clearing Station, and in George’s case to a General Hospital. Because of the time taken to move through the medical system, and his Soldier’s Papers did not survive, we cannot be sure when George was wounded. His Division was not involved in the First Day of the Somme (1st July 1916), but came into action during the second week. They were involved in the capture of Contalmaison (10th July), the Battle of Bazentin Ridge (14th July) and the Battle of Pozieres (23rd July and onwards). George may have been wounded in one of the above actions, or just in the day-to-day attrition of the Somme battle. George is buried in St. Sever Cemetery, Rouen, a mile south of the city centre.